In addition to reviewing Katharina & Martin Luther: The Radical Marriage of a Runaway Nun and a Renegade Monk, I also had the chance to interview its author, Michelle DeRusha about her writing process and what she learned from writing this fantastic book. Jen: How did you become interested in the story of Katharina and Martin? Michelle: I actually wrote a short chapter about Katharina Luther in a previous book (50 Women Every Christian Should Know). When my editor asked me who I would choose if I could pick one woman to write a full-length biography about, she was the first person who sprung to mind. I found her intriguing, and because there is so little information about her, I was enticed by the challenge of piecing together a bit more of her story. 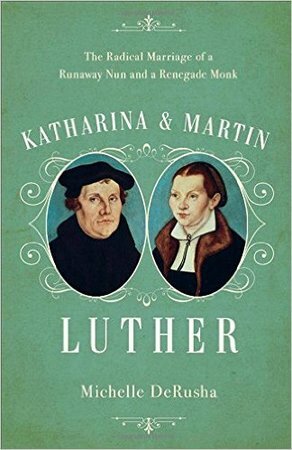 With 2017 being the 500th anniversary of the Protestant Reformation, my editor figured it was a good time for a book about Martin and Katharina Luther. Jen: Given the sparse details that remain about Katharina's life, how did you approach researching your book? Michelle: It was definitely challenging. There are a couple of biographies about Katharina Luther available in English, as well as several articles and chapters in other books about women in Christian history, so I started there. Then I tried to fill in the details by reading accounts written by some of her contemporaries. For instance, in order to understand what life might have been like for Katharina in the cloistered convent, I read accounts written by abbesses and other nuns during that time, as well historical sources about monastic life. There was some educated surmising involved, but I do think the picture I painted of Katharina’s life is pretty accurate, given what I learned about other women who lived during that time. Jen: How might knowing the story of Katharina and Martin help people to better understand both Martin Luther the man and Martin Luther the reformer? Michelle: That’s a great question! I think learning more about Martin Luther’s personal life as a husband and father allows for a deeper, more nuanced understanding of who he was. In his own writing, Luther was fairly black and white on issues like marriage and the roles of men and women in society and in the home. But in reality, those lines were a bit more blurred. He had enormous respect for and trust in Katharina, not only as the mother of their children and “supervisor” of the household, but also as a businesswoman and an intelligent critical thinker in her own right. It’s easy to think of famous historical figures like Martin Luther as one-dimensional – Martin Luther as the Great Reformer or the Great Theologian – but considering their personal lives helps us to understand them as three-dimensional human beings, complete with flaws, gifts and personality quirks and not so unlike our own selves. Jen: Why should people outside the Lutheran tradition care about the Luthers? Michelle: Martin and Katharina Luther were two ordinary human beings in a long, long line of ordinary people God has used to accomplish extraordinary things in his name and for the good of his people. Luther was an ordinary monk; Katharina was an ordinary nun; they were not slated for greatness from the get-go. And yet, today we look at the Luthers as two of the most famous leaders in Christian history. Martin Luther radically changed the history of the Christian church, something that not only affected religion and our various Christian denominations, but the world and our history overall. I found their story truly inspiring and encouraging, and I think others will too, regardless of denominational or even religious affiliation. Jen: Why do you think the story of Katharina and Martin matters today? Michelle: In this present time, when there is so much political, social and even religious unrest, looking back at Martin and Katharina Luther and at the Protestant Reformation offers us a much-needed perspective. History allows us to see and understand the big picture, a perspective we often lose when we are right in the middle of it. Looking back, we can clearly see how God does indeed work all things together for good, and that big-picture view can offer us hope, faith and the courage to persevere right now, in the midst of challenging times. Jen: 2017 is the 500th anniversary of the reformation. What do you hope today's church learns from reformers like Katharina and Martin Luther? What impact might that learning have on today's church? Michelle: Sometimes I reflect on how terrifying and overwhelming it must have been for Martin Luther to take on the Roman Catholic Church. The Church was a machine – it was the government and religion entwined together into one enormous, corrupt bureaucracy. Luther was one ordinary man, a monk and a theology professor, living in a small city in Catholic Germany, and yet, he simply could not stand silent in the face of the egregious abuse of power and the corruption and chaos he witnessed in the Roman Catholic Church at the time. I think we as Christians, and the Christian church as a whole, need to look to Martin and Katharina Luther as our example and call out the abuse of power when we see it. It’s the ordinary people who are the radical revolutionaries, the change-makers. We cannot and should not rest content on our 2,000 years of Christian history, but instead, should be poised and alert, ready to call out corruption and to initiate change. Who are the Martin and Katharina Luthers for such a time as this? Perhaps it’s you and me. Order your copy of Katharina & Martin Luther: The Radical Marriage of a Runaway Nun and a Renegade Monk here!